The VooPoo Drag Mini with the Uforce T2 tank is a great medium level wattage starter kit, going to 117W is perfect for most vapers. The VooPoo mini makes your life easier with it's built in 4400 mah battery. So no external batteries are needed for this kit. The VooPoo Drag Mini also is equipped with the Gene Fit Chip for battery efficient outputs along with various power modes to get the most out of your UForce tank. 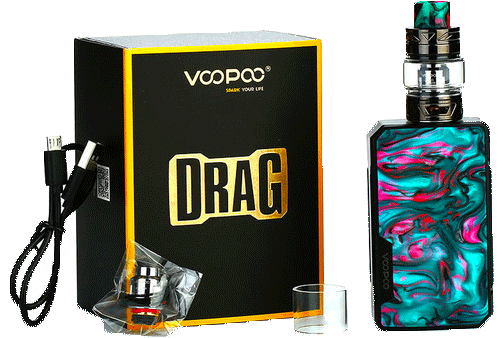 The Mini Drag looks almost identical to it's older cousin The Drag 157W Box , with the eye catching designs. The 157W Drag does accept the external batteries if that's a must for you. The UForce T2 Tank features 5ml maximum ejuice capacity, and a sliding top fill design. The tank has a triple slotted airflow control and utilizes the UForce OCC coil system. NOTE: Each VooPoo Drag mod may vary slightly in coloring as each product is unique, photos are for reference. The charging port on voopoo drag mini doesn't charge correctly. You have to keep moving it to make sure it is actually charging. The strangest name for a vaping mod, Love the device, wish they would of come up with a better name then voopoo. Feel stupid even saying it but its one of the best mods ive ever vaped with so im putting up with the poo poo name. This is the best vape unit I've bought EVER!